So, you may not know this but I used to be a big advocate for Linux. I started to use Linux back in 1994 and have always had a distro installed on my computer since about 1995. I remember, back then you had to download it onto floppy disks – there were 98 of them if I remember correctly. The installer, depending on what you chose, told you which disk to insert next and you had to say yes or no as you went along – meaning around 1-2 hours to install. I also, somewhere, still own and have the first ever distro released on CD Yggdrasil Linux which was brilliant at the time, meant I only had to sit and click yes and no and not have to keep swapping disks. From there I used to get the Slackware distros each release. I finally moved away from Slackware to SUSE (just as info, I recently installed the latest OpenSUSE) which was fantastic at the time. More distros were being released, so more to play with. I spent a few years using Ubuntu. I haven’t had a distro installed from around 2 years up until recently. I was using Mac more, so didn’t install. 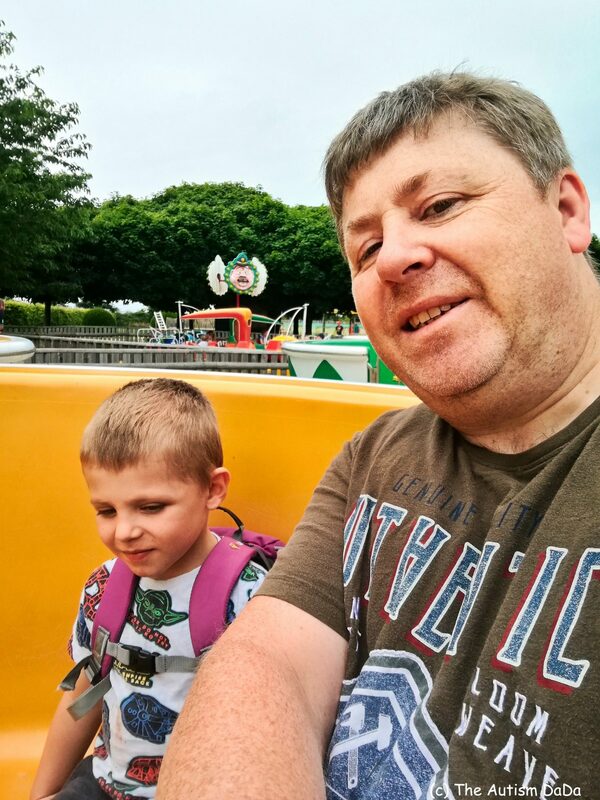 Now though, I have just started back with the Linux install and so wanted to start exploring what is available now – and show everyone that it is a brilliant OS (as well as being free) for you to install and use to blog from. Especially if you have older hardware. So, today I am going to talk about my Top 5 programs/apps that I use and you should install and use to blog from your Linux Distro. I love to write my posts, not by logging into the WordPress backend, but rather from an app on my desktop. I like to save a local draft rather than clutter up my posts, and then I like to submit it from the desktop straight to my blog. If that is something you like to do, or maybe its something you would like to start to do. Then Blogilo is the application for you. 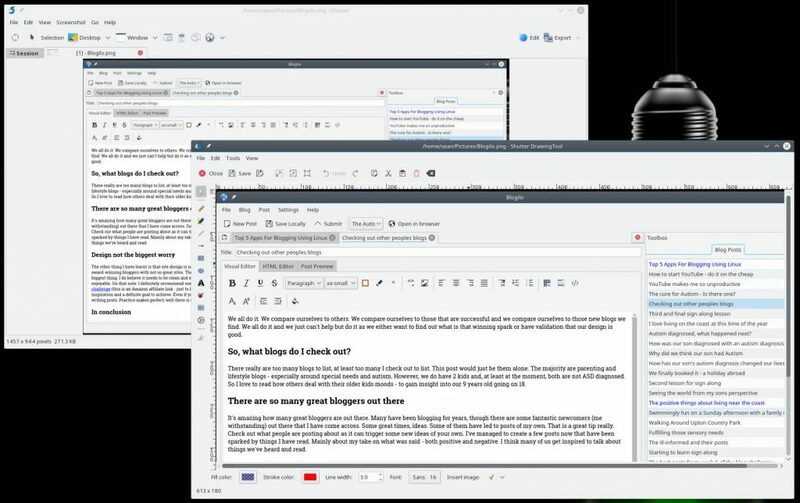 Blogilo allows you to connect to your blog, or even have a connection to multiple blogs meaning you can write a post for more than one in the UI. It doesn’t only just support WordPress either, you can set up blogs that use WordPress, Blogger, BlogSpot, MetaWeblog, and MovableType. It’s also so simple to do, you enter your homepage, username, and password and then click an auto-config button. If it can’t work out what your blog is running on, you goto the advanced tab and choose from a drop-down. Once connected, you can see previous posts on the right-hand side; as well as categories. post options (this is where you can change the timestamp of your post if you want to schedule it for the future) as well as any local entries you have created (posts saved to your local drive). 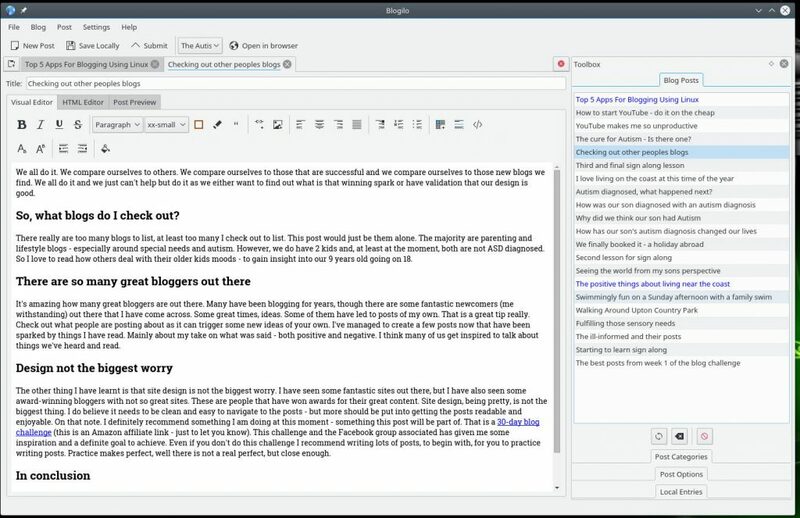 The editor allows you to create posts in a simple but easy to navigate editor or in an HTML editor. Similar to if you were writing in the WordPress post backend. I prefer the Visual Editor myself. When editing you can save it locally and then when complete you can submit it.Very simple and easy to use but means you don’t have to open up your browser and login – you can just run the app. This is why it is my number 1 app used and suggestion. GIMP, although it always reminds me of a certain movie, is my go-to graphics editor. GIMP, which stands for GNU Image Manipulation Program, is the tool I use to reduce the size of my images, add text, edit, crop, cut and anything else that is image related. It’s such a powerful editing tool that I am often surprised it is free. I even love the fact you can create web headers from the templates in it. If you’ve never used GIMP then you need to grab it now. So, as part of blog posts (such as this one), you may be looking to grab some screenshots. You may want to grab some of some applications you are running (again, such as this post) or for some other reason… mainly for application screenshots, I would have thought. Shutter is the app to get. Not only can you capture but you can edit too, all from this one tool. That is why it makes it into my top 5; I take many screenshots and on Linux, this is my go-to tool. So, creating your post is done, its schedules or published. The next important task is to get it seen and out there. I, personally, love Twitter these days. Its great for getting your post out there; even more so for talking to like-minded people. I have gotten a few ideas from the people I have talked to; many of which have inspired me down a path to a post or two. I could not be without Twitter these days and these great bunch of people that I interact with. 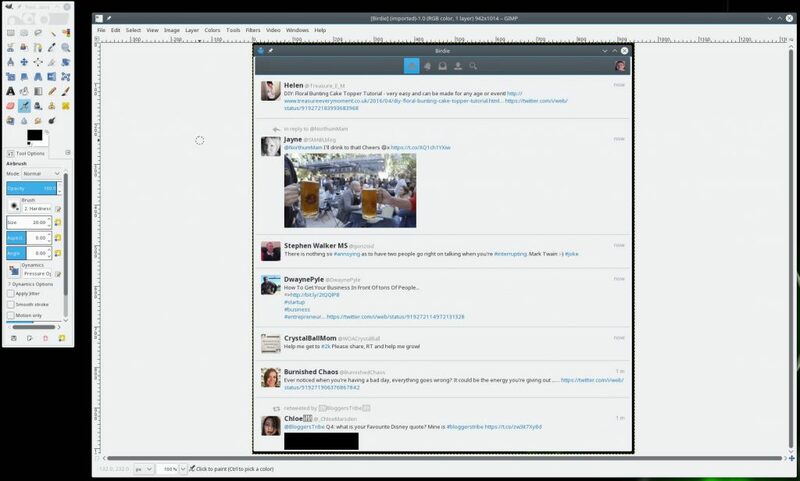 For my twitter interactions on Linux, I use Birdie. Birdie is an easy to use Twitter app that easily allows you to view posts and images, but also create posts and send images. You can also do all those other things like view mentions, direct messages, profile, and search. 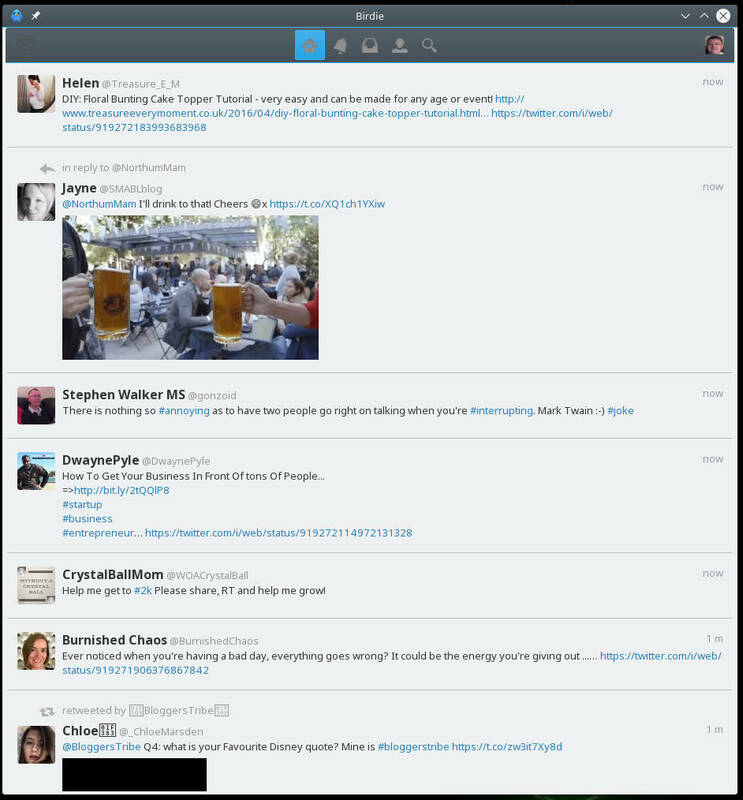 For your twitter needs on Linux, Birdie is, in my opinion, the best app to use. So, my final app in my top 5 is Pidgin. Pidgin is a universal chat client that allows you to set up a number of chat streams in one application.You can set up your ICQ, AIM, Skype and some others from this one tool, meaning you don’t have to have loads of other chat clients running. 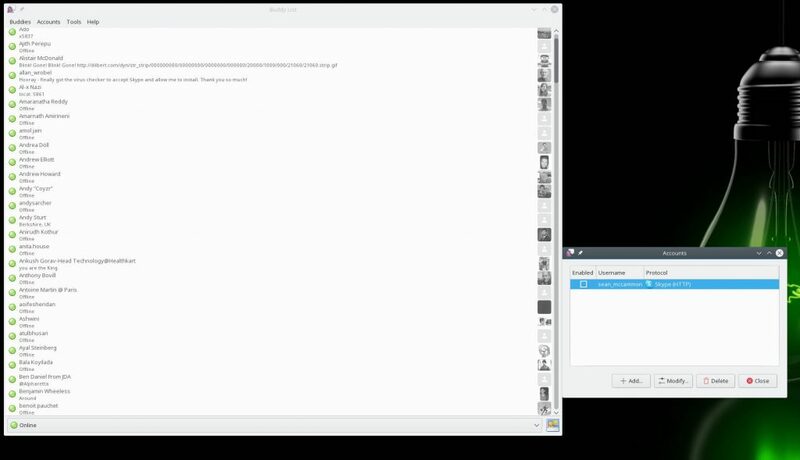 I use Pidgen mostly for my Skype under Linux, though I do often add my ICQ (amongst others). If you’re looking to have chats on the go, especially if your a co-author of a post, then Pidgin is my suggestion of your go-to app. So, there you have them. My top 5 Linux apps. the top 5 apps I would suggest anyone should be using to blog on Linux. You may already know these, you may know some or you may know none of them. Go check through out, as well as OpenSUSE or some other distro. 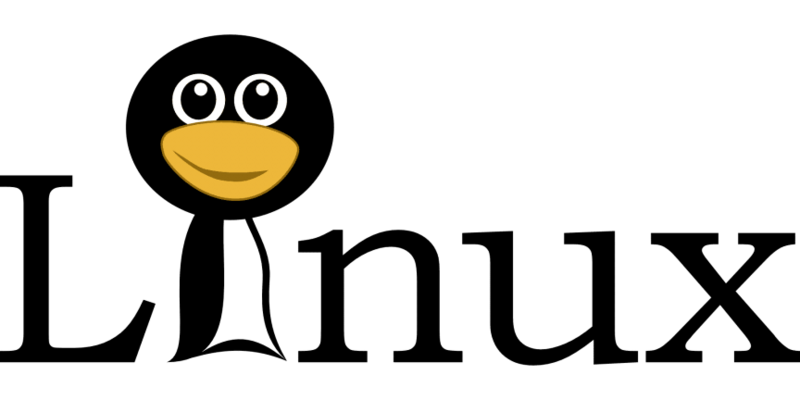 Linux is a powerful and easy to install and run OS these days… and its free. If you have any other suggestions for Linux blogging apps then why not leave them in a comment below. I would love to hear your suggestions, there may be an app I don’t know about myself and learn it from you.